Redwood Falls City Hall is located at 333 South Washington Street, Redwood Falls, MN 56283; phone: 507-637-5755. Photo: H.D. Chollar House, ca. 1878, 4th and Minnesota Streets, Redwood Falls, MN. Listed on the National Register of Historic Places in 1980. Photograph by User:McGhiever (own work), 2012, [cc-by-3.0 (creativecommons.org/licenses/by/3.0)], via Wikimedia Commons, accessed March, 2014. The area that would become Redwood Falls was first settled about 1864. Colonel Sam McPhail, who had been through the area leading troops during the Dakota uprising, was the first to purchase property when the Indian reservation lands were opened up for settlement. His land would be that upon which the city would ultimately be built. 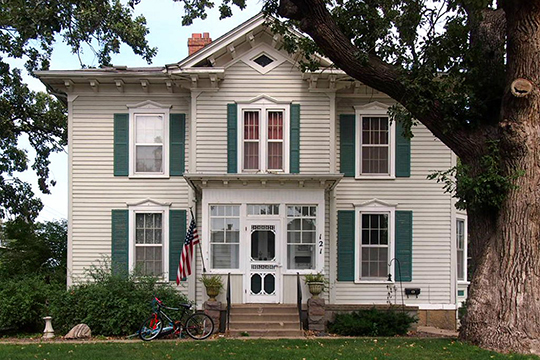 McPhail built a log cabin and stockade and then brought his family to Redwood Falls. He was joined by John St. George Honner with his family in 1864. Honner served as one of the first county commissioners and later as both a State Representative (1866-1871) and State Senator (1873-1874). Redwood Falls is perhaps best known as the birthplace of the Sears and Roebuck Company. Richard W. Sears, a railroad employee, discovered the mail order business when he obtained the rights to sell watches that were part of an order refused by a jeweler in the town. He left the railroad and set up his new business in Minneapolis, later moving the business to Chicago with his new partner, watch repairman Alvah R. Roebuck. History of Redwood Falls, www.ci.redwood-falls.mn.us, accessed April, 2012.